“…his earthy guitar and lower register vocals are often reminiscent of Eddie Veder.” – LA Yoga Magazine. 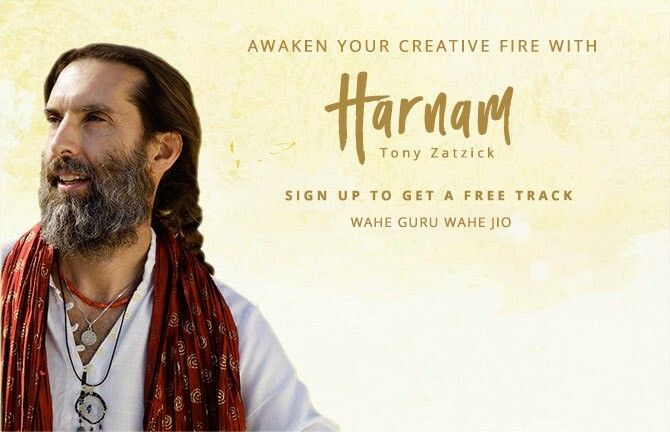 Originally from California, Harnam’s unique creative and spiritual perspective is rooted in his powerful connection with nature. This is apparent in the authentic quality of his music where he often blends genres and pushes boundaries. His latest release, the single “Guru Ram Das – Mystic Heart” with producer Anthony Molina combines the sacred and secular to form a unique and powerful expression of the divine. The full album will soon follow featuring new songs and sacred chants from the journey. His other recordings include the critically acclaimed: “A Fearless Heart”, “All Roads”, “Awakening Your Creative Fire” and “Removing Obstacles”. He is a Kundalini Yoga teacher who tours internationally, performing and teaching at festivals and yoga studios. Also known as Tony Zatzick, Harnam has lived, worked exhibited in both Europe and the Americas. His work has been selected for exhibition by many well-known artists and critics including Irving Sandler, William Bailey, Graham Nickson, Charles Cajori, Barbara Grossman and Bernard Chaet. His work has been included in exhibition alongside Philp Pearlstein, Janet Fish and Jamie Wyeth. He received a BA in Painting from the University of California at Santa Cruz in 1989, studied at the New York Studio School, and received an MFA from Western Connecticut State University, where he was awarded the Master of Fine Art award in 2004.